You are what you eat. That’s old news. 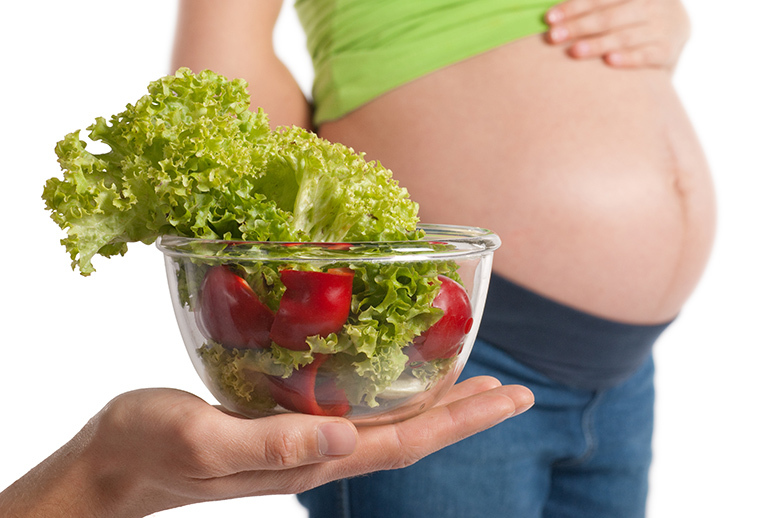 So is the fact that your diet during pregnancy affects your newborn’s health. But the new news is that what you eat in the next nine months can impact your baby’s health, as well as your own, for decades to come. Here are 10 easy nutrition rules that will benefit you both. Ideally, you need 400 micrograms of this B vitamin daily before conceiving. Because sufficient intake in the first trimester reduces neural-tube defects such as spina bifida by 50 percent to 70 percent, you should increase the dose to 600 micrograms when pregnancy is confirmed. Recent research suggests that supplementing with folic acid for a year before pregnancy and in the second trimester may also reduce the risk of preterm delivery. As many as half of women gain too much weight during pregnancy. The upshot: an increased risk for preeclampsia, gestational diabetes and delivery of either a preterm or a too-large baby. Talk to your doctor. Getting enough DHA (found in abundance in seafood and flaxseed) is one of the most important things you can do for your and your developing baby’s health, nutritionists say. DHA is the omega-3 fatty acid that can boost your baby’s brain development before birth, leading to better vision, memory, motor skilled and language comprehension in early childhood. Eat at least 12 ounces a week of low-mercury fish, or take a DHA supplement (both are safe). Behavior problems, learning disabilities, attention deficit disorder, hyper-activity and aggressive behavior in children can result when mom drinks during pregnancy. No amount of alcohol has been shown to be safe. During pregnancy, your iron needs nearly double, to about 30 milligrams per day, to support your 50 percent increase in blood volume and promote fetal iron storage. Iron transports oxygen, and your baby benefits from a healthy supply. To boost absorption, combine iron-rich foods with vitamin C; for example, load your chicken burrito with salsa. To protect your baby from harmful bacteria such as Listeria, Salmonella and E. coli (any of which can, in severe cases, cause miscarriage or preterm delivery), steer clear of soft cheeses made with unpasteurized milk, as well as raw or undercooked meat, poultry, seafood or eggs. Keep your fridge below 40 degree F, and dump leftover food that’s been sitting out for more than two hours. About 300 milligrams of caffeine per day, the amount in about two cups of coffee, has long been considered acceptable during pregnancy. But a study found that consuming 200 milligrams of caffeine per day increased the risk of miscarriage. “There’s no magic cut-off point, but the less the better. If you constantly indulge in fries and shakes now, your child might clamor for dairy Queen in the future, animal research suggests. “Somehow a salty, sugary, high-fat, low nutrient diet seems to program a baby’s taste preference. Aim to get at least 1,000 milligrams a day; your baby needs it for tooth and bone development in the second and third trimesters. Plus, if you don’t get enough calcium in your diet the fetus will leach it from your bones, which may increase your osteoporosis risk later in life. A diet high in fruits, vegetables and whole grains helps prevent constipation and hemorrhoids and keeps you feeling full so you are less likely to overeat. High-fiber foods also are packed with vitamins, minerals and phytochemicals essential to your baby’s development. Aim to get at least 25 milligrams to 35 milligrams of fiber a day, about twice what most Americans consume. Where To Get It: Fruits, vegetables, whole grains, legumes (beans and peas). Where To Get It: Dry beans, meat, oatmeal, tofu.